JAZZANOVA’s Sonar Kollektiv label celebrated its 10th anniversary in 2007. They took the occasion to form the Sonarkollektiv ORCHESTER – a Sonar Kollektiv super-group made up of label artists and friends. This fifteen musician strong ensemble is almost a big band and so truly earns the name “Orchester” (Orchestra). The complete instrumentation is 3 vocals, 4 strings, 3 horns and a full rhythm section. 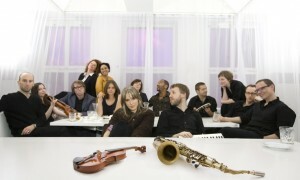 The orchestra is led by the extremely capable VOLKER MEITZ who has worked with JAZZANOVA, CLARA HILL, PAT APPLETON (singer of DEPHAZZ), PHONIQUE, PATRICK MAJER (producer of WIR SIND HELDEN and ROSENSTOLZ) amongst many others. With numerous releases with his own project MEITZ and countless gigs all over the world, VOLKER is impeccably qualified for the job as musical director of the SK ORCHESTER. He’s also responsible for all the arrangements and plays keyboards in the live set-up. Volker is joined in the SKO by highly skilled musicians of mostly classical and jazz education, each at the pinnacle of their creative powers. Five of today’s finest singers make up the bands core vocal presence. These are ESTHER COWENS, WILSON MICHAELS, GEORG LEVIN, LISA BASSENGE, SASCHA GOTTSCHALK and CLARA HILL. ESTHER COWENS is already known for her own project GREENISSIMO and on top of that has also sung for MEITZ, SAM RAGGA BAND and JAN DELAY. WILSON MICHAELS has most recently appeared as the lead role in Lion King the musical, while CLARA HILL needs no introduction; she is a mainstay of the Sonar Kollektiv scene.